In July 2018, Sandra Naumann from the Ecologic Institute joined the 2nd International Seminar on nature-based solutions in Brasilia (Brazil) to discuss the state of knowledge, experiences and challenges to implement nature-based solutions (NBS). She presented an overview of the almost 1000 NBS contained within the Urban Nature Atlas as well as results from the EU and national policy review conducted as part of the EU-funded NATURVATION project. Attendees included over 100 representatives of Brazilian and European cities, national and local authorities and decision makers, research, business and international organisations. The presentation slides are available online. What experience and knowledge about nature-based solution (NBS) do Brazilian and European cities possess? To what extent have NBS been deployed to cope with urban and societal challenges in these contexts? How can the EU research and innovation agenda foster the demonstration and upscaling of nature-based solutions in Europe and Brazil? These questions shaped the agenda of the second International Seminar on NBS in Brasilia. Co-organised by CGEE, DG Research and Innovation (European Commission) and ICLEI, this seminar presented the concept of NBS to Brazilian stakeholders and contributed to ongoing efforts to develop a Brazilian roadmap for NBS. The seminar presented not only an opportunity to bring the voices of local governments to the discussion, but also represented a starting point to rethink a national transition from grey to green infrastructure across cities. Brazilian and European project and city representatives joined members of the research community to present a wealth of inspiring NBS initiatives. Presentations and discussions revealed that the major challenges facing Brazilian cities in implementing NBS are the very limited financial resources in the public sector, low awareness of NBS as cost-efficient and sustainable measure to foster sustainable urban development, and the current, largely inflexible government structures that hinder licensing NBS initiatives and integrating NBS as new standards into planning policy. Brazil aims to approach the environment more holistically in the future and – as a first step – has initiated a dialogue with different sectors to improve the current management of natural resources and strengthen the uptake of NBS. The Sustainable City Innovation Observatory, which is currently developed by CGEE within the framework of the Global Environment Facility project, will provide a framework/mechanisms for cities to develop their own vision of a sustainable city and pick from a basket of NBS that can be tailored to diverse contexts. The participants expressed a strong interest in continuing and strengthening cooperation between Brazil and the EU. Ideas include to exchange experiences and knowledge through available platforms and cooperate in research projects, with a specific focus on the development of suitable indicators to assess the impact of NBS, integration ecosystem services in cost-effectiveness assessments, and development of business cases to foster public and private investments. 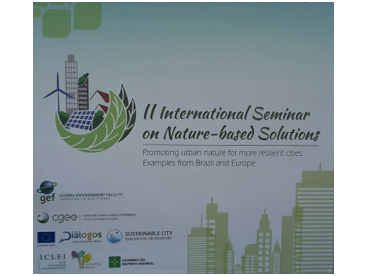 2nd International Seminar on Nature-Based Solutions (NBS): Promoting Urban Nature for more Resilient Cities.